Knitting with linen is always tricky. Swatching isn't as exact, because your fabric with ease up significantly with repeat washings and lengthen if the garment has any weight at all to it. And, because I have a very loose gauge from the get go, swatching is even riskier business for me on linen. My first swatch for Aster was on size 8 needles. The pattern recommends 9. And it was huge. Very pretty but huge. I would have knit a monster size garment. I went down to size 6 needles and after washing, blocking and stretching the swatch (to imitate normal wear), I had gauge. Or at least, I had stitch gauge. My row gauge is off for the garter stitch piece. Interestingly, the pattern suggests going down a size when you hit the garter stitch block at the top, and that gives me row gauge. But not stitch gauge. So I'll do some math-fu on that part. After swatching, I was distracted by two sweet little stray kittens who came to live with us this week. Aren't they cute? They ADORE knitting. This is not a good thing. This pattern calls for negative ease, and I'm knitting it for my daughter, so I chose the 31.5" size. The next size up, at 34" would have been far too large. The start is stockinette stitch, and you can see that it rolls. The roll up at the bottom concerned me, but looking at the pattern photos I saw a slight roll. I'm hopeful that as the garment grows in size, its weight will work on that. I'm not sure that hope is going to work out, because I'm past the first set of decreases, but I still have a roll of linen. And on the gauge front, as I thought might happen, even with my best efforts to knit tightly, I'm still getting enough fewer stitches over time that I'm please with the choice of the 31.5" size. It's too early to tell if that will hold up, but as of right now, even with the stretching that is inevitable as the garment grows, I think I should get a good fit. Finally, a word about the yarn. This is Quince and Co's linen tape yarn, Kestrel. 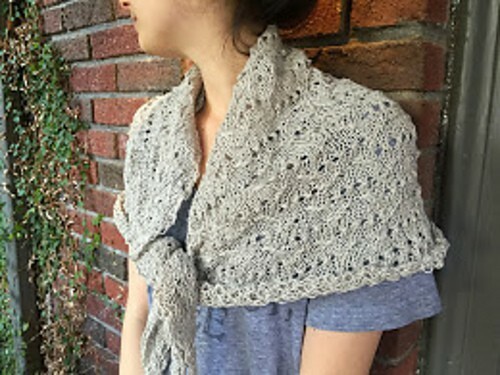 I love their sport weight linen, Sparrow, which is a typically spun yarn, and which I used for Lida last summer. The verdict is still out on Kestrel. I had a knot in the first skein after knitting three rows, which did not get us off to a friendly start together. But this is a good project to test it out on and see how it performs.